For most PSA the only true adhesive force available is from the surface energy interactions. As discussed throughout Practical Adhesion such adhesion is uselessly small for most applications, giving a Work of Adhesion of 40mN/m or Peel Strength of 40mJ/m2 which happen to be the same thing. "Real" adhesion giving 40J/m2 (i.e. 1000x stronger) requires intermingling and entanglement across the interface. Yet PSA can easily attain such a peel strength with nothing more than 40mJ/m2 actually holding things together. How can this be? A PSA can't change the laws of physics. If its "true" adhesion is only 40mN/m2 then that's what will be measured - if the measurement is done in the right way. At very low speeds and/or at very high speeds this is indeed found. Or, via WLF, at very high temperatures and/or very low temperatures this is indeed found. So be careful that your PSA doesn't find itself being used in conditions where its "true", low peel can be revealed or, alternatively, take advantage of the fact that under some circumstances the PSA is very strong and under other, controlled, circumstances it can be easily removed. All you need is to ensure that G' and G'' are tuned for the correct temperature/time ranges. If you seem to have the perfect PSA, how can you check that it's in the right domain? A very simple test is to manually pull very slowly and/or very fast. If the peel starts to show adhesive failure when pulled slowly or stick-slip when pulled fast you know you are in the right place. However, the "cohesive" domain can also show a clean peel because at the last moment the acute peel angle of the cohesively stretched adhesive is enough to drag the remnant from the substrate. 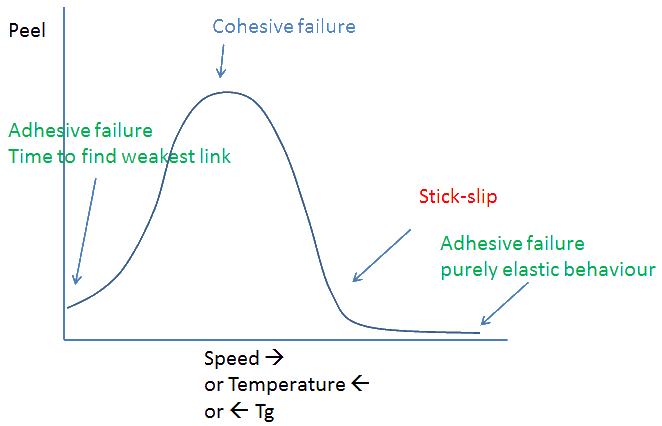 The only way to distinguish true adhesive failure from cohesive failure masquerading as adhesive failure is by careful video analysis of the peel step, something most of us can't be bothered to do. PSA get their strength from weakness. The forces that would otherwise rip the adhesive away from the interface are used up in pulling the adhesive apart. Via some mix of crazing, cavitation or stringing (see the images of the Probe Test) the energy is absorbed and the interface never experiences more than 40mJ/m2 - except, as discussed previously, if the force at the "possible detachment point" is strong enough to give adhesive failure and, therefore, a clean peel that can be confused with "normal" adhesive failure. This brings up an important point. 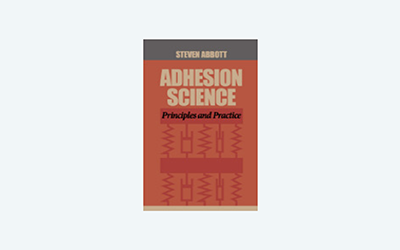 For "real" adhesion modest changes in surface energy make no significant difference to overall adhesion, though they might indicate potential contamination problems that will change adhesion. For PSA small changes in surface energy can make a large difference to adhesion. The peel strength of a PSA with a surface energy of anywhere from, say, 25 to 60mN/m might be identical (say 40J/m2) - the surface energy making no difference. But if the crack energy being absorbed by the PSA (giving the high value) happens to leave a residual stress of 25mN/m then a surface energy of 24mN/m would fail. Of course this same surface might pass a test at a slower speed or a higher temperature. But remember that a F-surface with surface energy of 20mN/m can show strong PSA adhesion while a siloxane surface with the same surface energy will show failure (i.e. release when this is a requirement). The "failure" is nothing to do with surface energy and is due to the more "liquid" nature of the siloxane surface which cannot dissipate the PSA energy. The key issue is how to get the weakness right. This issue is coupled to the interesting question on the roles of "tackifiers" and "plasticisers" in PSA. Imagine that the PSA is made of some reasonably strong, solid polymer designed to give the PSA its main strength. But such a polymer has nothing "liquid" about it so has zero tack; i.e. its tanδ<<1 so there is no G'' component (the "loss modulus") to allow "loss" during peel (and G' exceeds the Dahlquist criterion). If you add a liquid plasticiser to it you certainly get some tack, but you also get a seriously weakened PSA. A plasticiser simply lowers G' and G'' at the same time. Of course there are times when a little plasticiser is required, but in general plasticisers add no value to a PSA. A tackifier, on the other hand, does two seemingly contradictory things: it makes the system more "liquid" (i.e. tacky) whilst at the same time raising the Tg. I have to admit that the first time I read about tackifiers raising the Tg I thought it was a typo. But it makes sense. A plasticiser lowers Tg. This means that at a given temperature the system is further from the Tg and therefore less strong - as all polymers lose strength away from the Tg. A tackifier raises Tg so the system is closer to the Tg and therefore relatively stronger. What you are really trying to accomplish is to lower G' to below Dahlquist (so a small-molecule tackifier is making things weaker, more liquid or tacky) whilst still keeping a high G'' to absorb a lot of energy. A plasticiser lowers both, a tackifier manages to lower G' while keeping G''. This is the secret of PSA and one that the experts have known for decades but which has been hidden from formulators because it requires the whole of G-values, WLF, Chang etc. before it makes any sense. There are plenty of tackifiers out there and they can all raise Tg as required. But for any given system most tackifiers are useless. You can create what looks like a workable formulation with the bad tackifiers yet the resulting PSA is awful. The scientific way to look at the difference between a good and bad formulation is to run some sort of scan (such as a DSC) which can reveal the Tg properties of the system. The poor system will show 2 Tg values - one for the base resin, one for the tackifier. A good system will show a single Tg which is higher than the Tg of the base resin. In other words, in the bad formulation the resin and the tackifier form separate phases. So you have a uselessly strong resin and a uselessly weak tackifier in some sort of mixture, and the result is the worst of both worlds. In a good formulation the tackifier is diluting the resin (lowering G') whilst raising the overall Tg and preserving G''. The practical formulator may not want to run all those DSC. It would be far quicker to know in advance if the resin and tackifier are mutually soluble. One way to do this is via Hansen Solubility Parameters (HSP) as described at Hansen Solubility Parameters. Very briefly, by knowing the three HSP values of the resin (these values describe Dispersion, Polar and Hydrogen Bonding forces) and the three HSP of the tackifier, a "Distance" calculation (sum of the squares of the differences of the individual values) can be made and those pairs of resin/tackifier with small Distances will be compatible. If resin and tackifier suppliers provided their customers with HSP values, formulation of great PSA would be much simpler. If your suppliers don't provide such values you can either ask them to do so (they can be measured rather easily in a lab which is setup to do so), find a supplier who does or do the measurements yourself. The more tackifier, up to a point, the stronger the PSA - strength through weakness. But there are always trade-offs. For PSA that trade-off is often to do with shear strength. 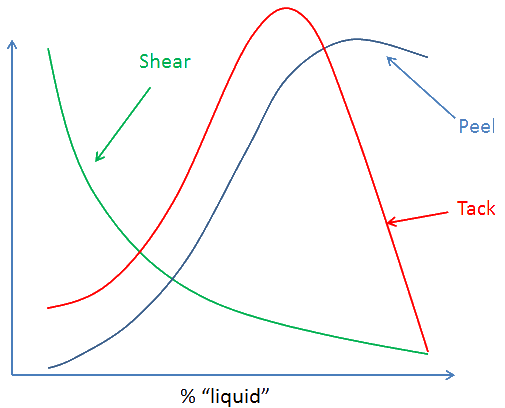 As the graph shows, adding more "liquid" tackifier increases the peel strength but the shear strength decreases (as does, after a point, the tack). Only you can decide where the trade-off should be for your particular application. When reading good academic papers by the best in the PSA field it becomes clear that with the right set of tests and measurements it is relatively straightforward to understand why a good PSA is good and a bad one is bad - for the particular application. But these analyses tend to be with the benefit of hindsight. Recipes for designing "right first time" PSA are thin on the ground. That's because there is so much going on - temperature, time, G', G'', not to mention costs and safety issues around raw materials, production issues and everything else required for a successful commercial formulation. So even the best-informed PSA scientists find it hard to formulate. The point of the PSA section of Practical Adhesion is not to give the impression that formulating PSA is easy. But the opposite point is very much intended: without the understanding of how PSA really work, formulation and optimisation are hopelessly difficult tasks - as too many PSA formulators have discovered. With a good understanding of PSA science, a formulation team can make rapid progress. But without good data, their progress is still going to be too slow. So management have to understand that the team need routinely to be able to measure Tg, G', G'', tanδ and carry out both peel tests and probe tests in addition to whatever QC tests (such as Rolling Ball) are required. In the past such equipment was impossibly complex and expensive. But we're in the 21st century and the price/performance equation has changed dramatically. Don't ask management if they can afford to get the required test equipment, ask them if they can afford not to.